Spirocerca lupi is a roundworm. It is red in colour and 40 – 70 mm long. The eggs contain the larvae and have the shape of a paperclip. The eggs and larvae are passed from one host to another and this process normally starts when an animal passes the eggs in its stools. For example, a dung beetle ingests the eggs while working with or rolling in infected stools. The larvae then hatch inside the dung beetle and develop into more mature forms. A bird, lizard or another small animal might eat the dung beetle and then become infected with the larvae. Your dog will then become infected by eating the bird or lizard, called an intermediate host. This disease has not yet been seen in cats. Once the dog has eaten an intermediate host, the larvae are released in the dog's stomach and then travel via the small arteries in the stomach to the aorta (this is the main artery in the body). This process takes about 3 months. The small larvae will then pass through the wall of the aorta into the wall of the oesophagus (the muscular tube which takes food from the mouth to the stomach. The aorta lies very close to the oesophagus in the chest. In the wall of the oesophagus the larvae form a swelling called a granuloma where the worms live and mature. As the worms grow, so does the granuloma which can then become big enough to put pressure on the windpipe and/or aorta and cause a partial blockage and irritation of the oesophagus. The pressure and irritation will cause coughing/wheezing and even breathing problems in your dog. If the blockage in the oesophagus is big enough you may also notice vomiting soon after eating. Other signs include loss of appetite and as a result also weight loss. These signs might not sound very serious, but this worm can cause life-threatening secondary changes to organs and tissues inside the body. The difficulty in breathing or swallowing can become quite noticeable and distressing for the animal. In long-standing cases the granuloma can become cancerous and if it stays in the oesophagus this growth is called a fibrosarcoma. It can also spread to the long bones (i.e. tibia, femur, radius and ulna). This will be seen as abnormal, and in some cases painful, swelling of the dog's legs. This is called hypertrophic osteopathy and over time this may become cancerous as well – normally a very malignant bone cancer called an osteosarcoma. As if this is not bad enough, the worms can also damage the wall of the aorta, causing the wall to become weak and thin forming an aneurism – a thinning and ballooning of a blood vessel wall. If this thinning is severe enough, the aneurism may burst, causing the dog to bleed to death within minutes. Unfortunately it is often at this very late stage when vets see these infected dogs for the first time. People bring in a dog that died suddenly during the night and Spirocerca lupi is diagnosed on post mortem. How is Spirocerca lupi diagnosed? It is not easy to diagnose a Spirocerca lupi infection partly due to the symptoms mentioned earlier indicating many different diseases. The most common presenting symptom is constant vomiting directly after eating. If your vet suspects Spirocerca lupi, an x-ray photo of your dog's chest will be taken where the granuloma may sometimes be visible. Spirocerca lupi eggs may also be seen in your dog's stools. If the vet cannot make a positive diagnosis this way, the next step is an oesophagoscopy. This is a test where a camera with a light source (called a scope) is passed into the dog's oesophagus through its mouth (for this procedure your dog will need a general anaesthetic). The granuloma or even the worm (protruding out of the granuloma) may be seen on the oesophagoscopy. How is Spirocerca lupi treated? The treatment is unfortunately not always successful as vets mostly see cases when the secondary changes have become very advanced. The medication your vet will use is not registered for the use in dogs (it is used in sheep as a deworming medicine), but is the only effective remedy available. For this reason if your dog is diagnosed with Spirocerca lupi, it can ONLY be treated by veterinarian and should be supervised closely. Many times the disease process is too advanced to treat in which case your vet will prescribe treatment to keep your pet comfortable. Some of the treatment could include ways to feed your dog to minimise vomiting, antibiotics (many infected dogs can develop pneumonia due to coughing and with subsequent inhalation of food particles) and even pain medication (in those patients with bone cancer). 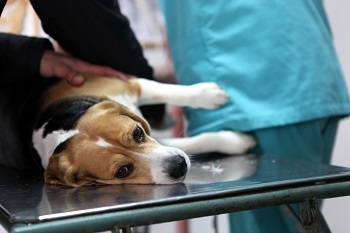 How can you prevent your dog from getting infected? The most important way to prevent this “disease” is to remove stools daily. It must also be disposed of in such a way that none of the intermediate hosts can get to it. You should also try to prevent your dog from eating any of the intermediate hosts. This might not always be easy in terriers or hunting breeds, but training from an early age should prove helpful. Fortunately there is now a registered spot-on product mainly used for tick and fleas available from the vet, which has been proven to be effective against Spirocerca Lupi. Please ask the vet about this product. If you are inclined to feed chicken or red meat to your dog, ensure that it is always properly cooked. Never feed raw meat to your dog, it might have been part of an intermediate host! In the end doing small things like regular parasite control with good quality products, picking up stools on a regular basis, following a proper feeding regimen with the correct dog food, and even puppy training can all contribute to a long and happy life for your dog and prevent them from picking up nasty infections.